The 'Menagerie' series is narrative that deals with themes of childhood, fertility, childbirth and motherhood as a lived experience. 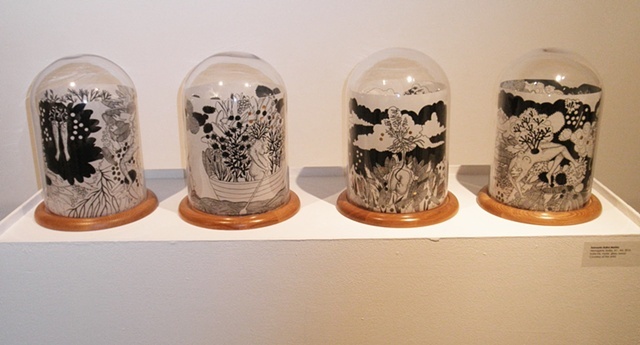 The work consists of four scroll-like drawings on mylar, which were originally displayed rolled into four bell jars. The drawings in the bell jars could be viewed from all around and when arranged in different permutations created alternating narratives. The title of the work refers to the seventieth and eighteen century European practice of keeping animals in captivity either as a luxury pastime or for domestic uses. The term later referred to refer to royal or aristocratic animal collections of wild and exotic animals. Menageries were also traveling animal collections to be exhibited at fairs across Europe and later on America. The artist uses the term to cast an oblique reference to her examine her own journey, experiences and dreams.